This month there are a couple of resolutions in our house, that may or may not work. Firstly my husband thought it would be a good idea if we did not eat any processed sugar during May. I do not remember agreeing to this at all, but it seems that sugar is off the menu. If the posts get erratic, the colours get to bright or I stop making sense, it is because I am suffering withdrawals. The second resolution for May was to finish up more of the quilt tops I have floating around. This resolution came about as I finished another two quilt tops this week and the pile of UFOs grew to an embarrassing level. More quilting less piecing. Combine this resolution with the other one and it could be an interesting month! 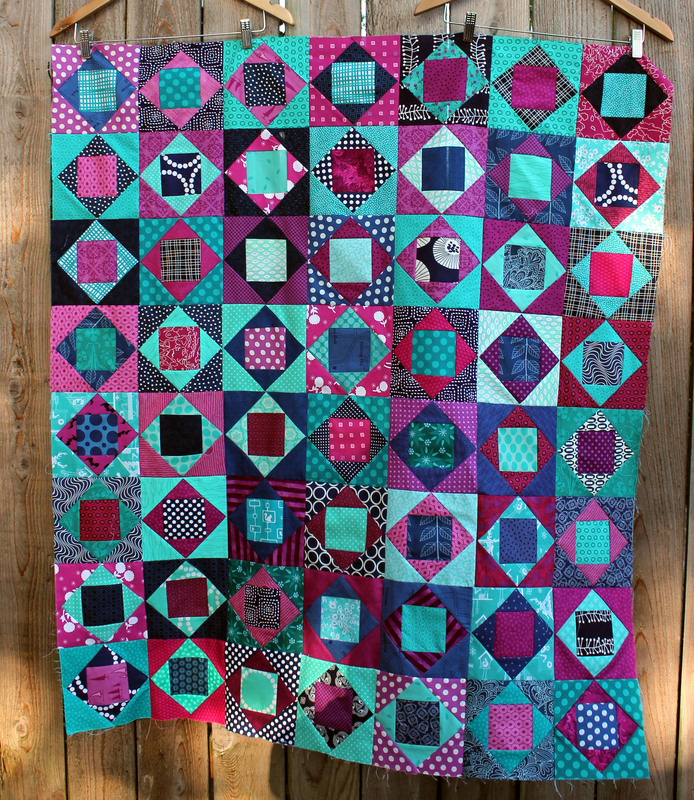 This was a fun scrap quilt to make – lots of turquoise, navy (my favorite colour) and pink/purple. I really like this colour combination, which I stumbled across while playing with my piles of fabric. The other quilt top I finished was my 1001 Peeps top. I was battling the wind when I was taking these photos. It is the problem of photographing tops as opposed to full quilts – there is no weight to hold them in place in even a gentle breeze. It is another reason why I have to quilt these suckers before I post. I see a lot of basting in my near future! I love the both. The pink/purple/turquoise is gorgeous! I love the random black and white in it. Oops the photo is not the best but the random black and white is actually really dark navy. It does a great pop though. i absolutely love the colors in the first quilt, and the border of the second quilt is so clever! Thanks. The 1001 peeps quilt called out for a border. Beautiful quilts!! It’s a great block for fussy cuts. Wow! I love the colors you use in your quilts. The turquoise and pinks – amazing. Thanks. I really do love playing with color. 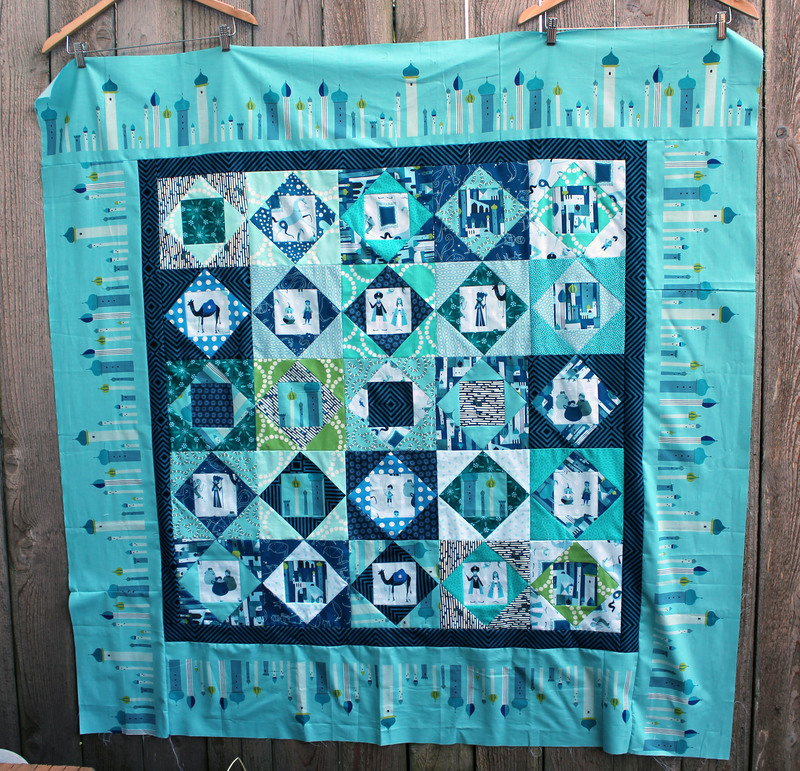 I’m so desperately in love with your 1001 Peeps quilt! The two random blocks with the green pearl bracelet print are just perfect. Thanks. 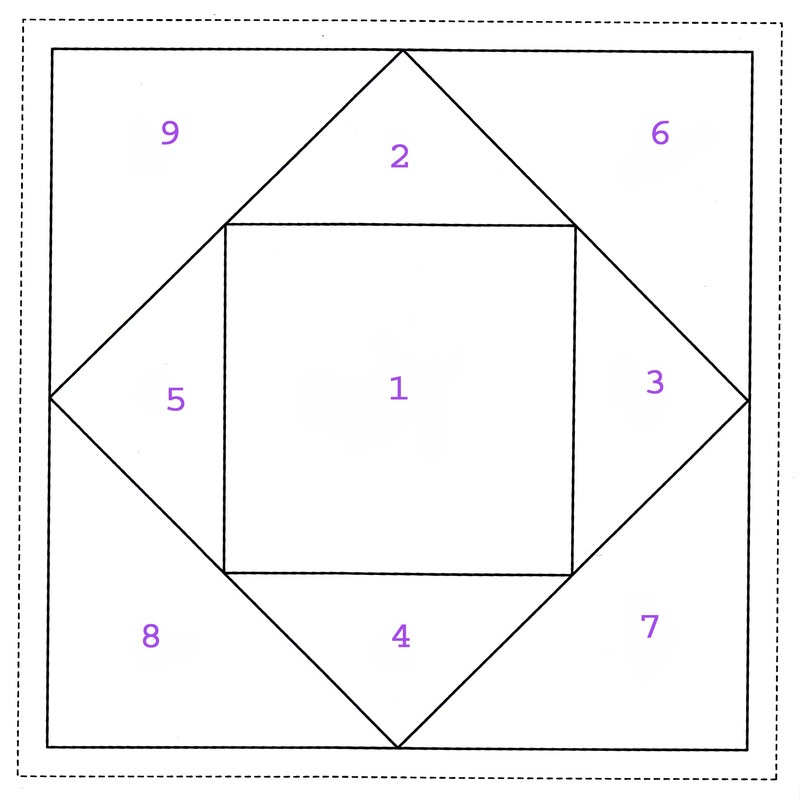 I think that I should have added just one more green spot – one more would have balanced it better. 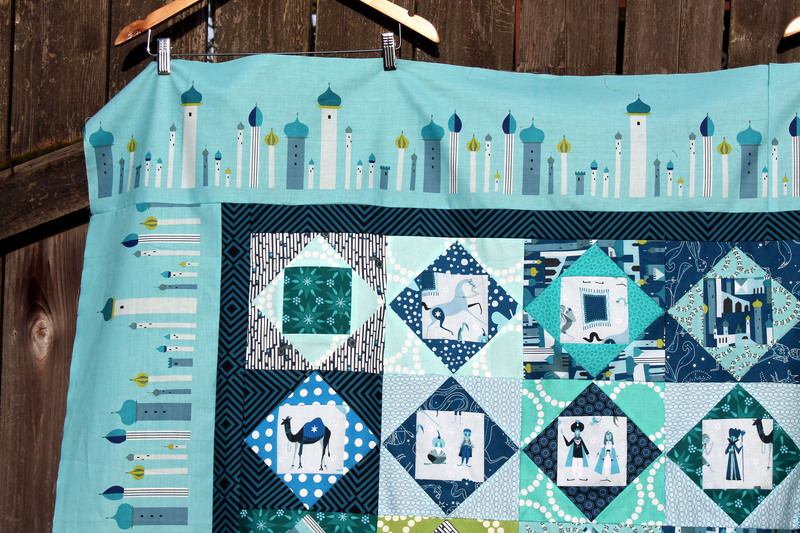 That 1001 Peeps quilt is stunning! So much fun! I really like this block, I’ve used it recently too. Your quilt tops are lovely. These quilts are so neat. I’ve said it before, and I’ll say it again. I love the colors choices. Love your color combinations–both here and in the aqua and red blocks! Thanks. 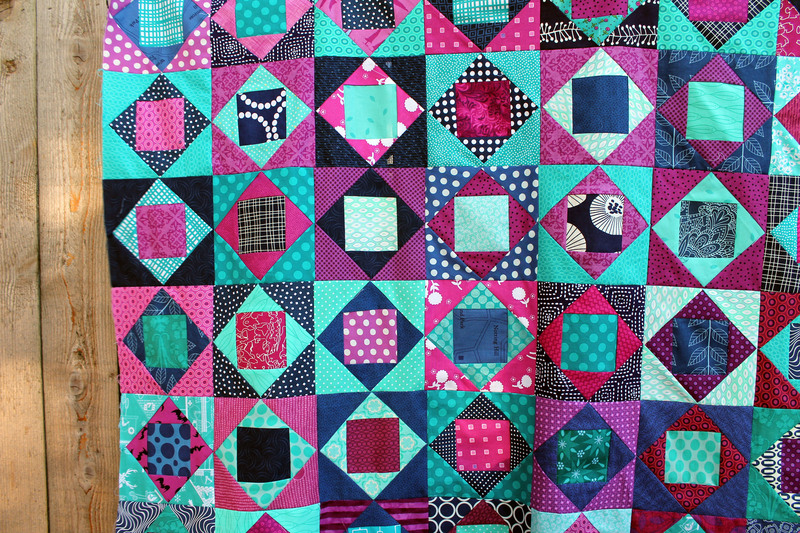 I love playing with colour combinations, it is the real fun of a scrap quilt I think.